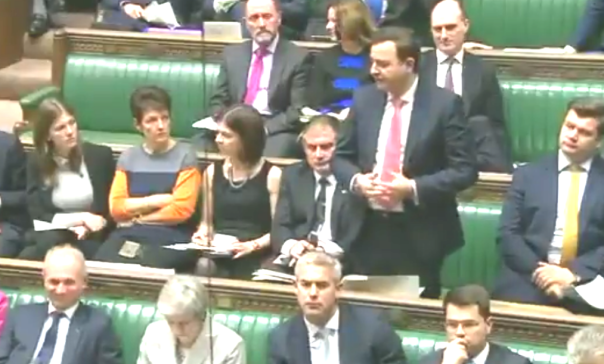 During questions to the Prime Minister following her Statement to the House on the Brexit withdrawal arrangements, local M.P. Alberto Costa took the opportunity to invite the Prime Minister to send a message to the year 5 pupils of Danemill Primary School in Enderby. On hearing that earlier in the day the M.P. had visited the school where pupils had asked him about ‘Brexit’, the Prime Minister said that she commended the pupils for enquiring about Brexit and asked that both he and the pupils be assured that her ‘deal’ negotiated with the E.U. sets the country on a course for a bright future and for the pupils it was about their future, their jobs and that is what her deal delivered. The exchange came during a day in which the Prime Minister had been touring media outlets in an attempt to ‘sell’ her agreement with the E.U. amidst criticism from many on both sides of the Brexit debate. An mp3 audio recording of the exchange is available below. I was delighted to tell the PM yesterday about my visit to @DanemillPrimary to speak to their excellent Year 5 class, and to receive her assurances that the Gov’t’s Brexit deal is in their best interest – great to hear her commend the brilliant pupils too!